As of late, I find myself reading a lot of Young Adult fiction. In fact, the last three books I have finished would fall under that category. A year ago, I would have scoffed at anybody who predicted that I would be reading what I considered kid’s books. Sure, I’d loved Catcher in the Rye, The Outsiders, Forever, and such as a kid, but I’m a full grown man now and there is no way I’d be interested in kid’s books. Here’s a news flash, kid’s lives are a lot different than when I was a kid. The issues and challenges they face these days are things that never would have entered my radar as a student. Issues like racism, poverty, police brutality, and social ostracization are all covered in today’s YA books. Not only are the subjects covered, but they written about with a maturity and depth that would belie their proposed target audience. In short, these books can hold their own against any form of literature. It was through Maplewood High School’s ProjectLit that I became exposed to the latest crop of YA titles. Last year, its co-founder, Maplewood HS teacher Jared Amato, and I sat down to talk literacy. I say co-founder because Jared would be the first to tell you that he is more a facilitator than a founder. It’s his students’ vision that created this group and continues to shapes the project to this day. At the time of our conversation, I was very dismissive of YA fiction and tried to steer the conversation with Jared back towards the classics, but Amato wasn’t having any of it. He said those books were certainly important, but every student needs material where they can see themselves in the pages. I didn’t really understand what that meant until I started reading these books. I get it now. Last year I went to a couple of the monthly meetings mainly to support ProjectLit under the misguided illusion that I was helping them out and being supportive. I didn’t read the books, or I read just enough that I could keep up with the discussion. I will admit I underestimated the power of the literature, but I never underestimated the power of the book club meetings. These kids made a deep impression on me right from the beginning. This year, I decided to try something different. I would read the books before going to book club. The first one was Towers Falling. That book moved me to tears several times while reading. I just finished The Hate U Give, which is better written than the majority of so-called adult fiction I’ve read of late. My son, Peter, and I have been reading Wonder every night at bedtime and he’s fallen deeply in love with the characters and their narrative. After last week’s book club at Maplewood, I realized that my attending hasn’t been me doing a favor for the students, but rather them doing a favor for me. Through them I have been exposed to some of the best writing I’ve ever experienced. Through them I’ve been exposed to new ways of thinking about old issues. Through them I’ve gotten a tiny peek of what the future is going to look like, and let me tell you, it’s pretty bright. I am forever grateful to Jared and his students for teaching this old dog some new tricks. 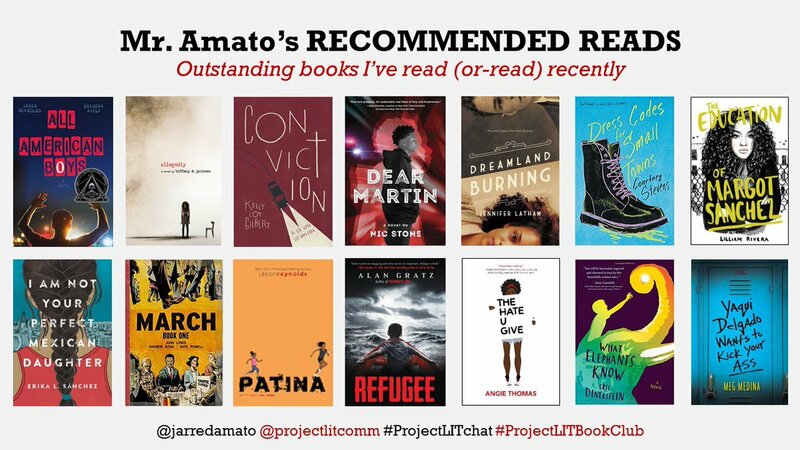 If you haven’t attended a ProjectLit Book Club meeting yet, I strongly encourage you to do. There is one Thursday of this week at Croft MS. Additional ProjectLit chapters are starting to spring up at schools across the district, so they are getting easier to attend. There is no better way to increase literacy among young people than reading a book with them and then getting together and talking about it. I look forward to the day when I look across the room and see both Mayor Megan Barry and Superintendent Shawn Joseph engaged with a group of students over a book they’ve all read. Last week, the state released TNReady scores for districts and individual schools. The weekend was then spent selling people on the relevance of those scores. Unfortunately not everyone was buying it. Tennessee State House Democrats called for a multi-year moratorium on holding students and teachers accountable on the state’s education test. They made this call based on the multi-year problems that have plagued TNReady. Speaker of the State House Beth Harwell has long been a staunch supporter of Tennessee’s standardized testing, but I guess even she has reached a breaking point after it was announced that 9,400 tests had been misscored. Harwell called for hearings after receiving the news. I guess late is better than never. The latest problems are just a continuation with the multitude of problems faced by states throughout the country. It just never ceases to amaze me how a process so flawed can have such ramifications. Testing does seem to be working out for testing companies though. Questar was recently sold to Education Testing Services for $127.5 million dollars. Which, if you are keeping score at home, means that in just two years Tennessee has had four companies oversee state testing. We started with Pearson, transitioned to Measurement Inc., than switched to Questar, and now Education Testing Services. You got that, right? Makes perfect sense, right? I would be slow to jump too high and cheer too loud for these results. While Knoxville students and teachers certainly deserve accolades for their hard work, they should be careful in validating faulty data. Too often we temper our criticism of standardized testing when it produces results that are palpable to us. Just because the results are favorable does not make them valid. 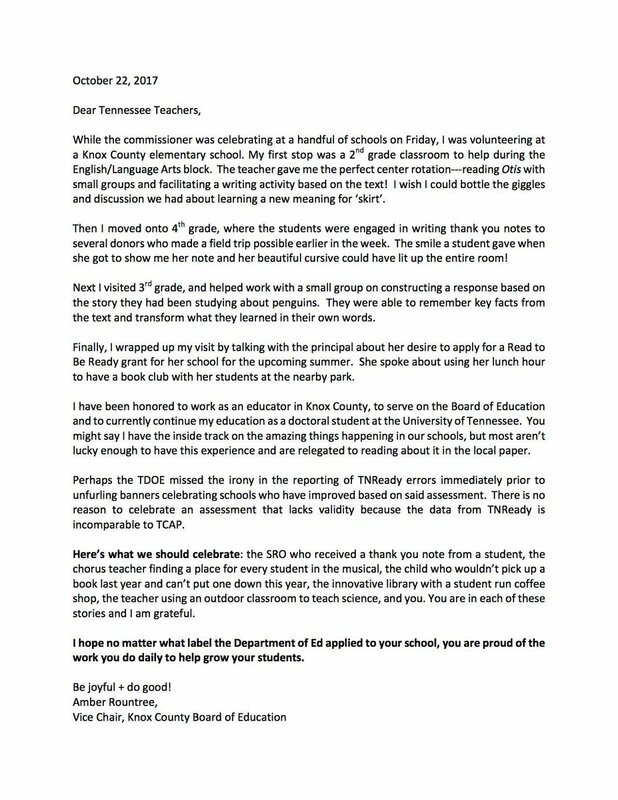 Schools need more accolades like those delivered in a letter by Vice Chairman of the Knoxville School Board Amber Roundtree. In that meeting was former KCS administrator and Broad Academy fellow Nakia Towns, who worked in Knox County for several years and is now the Assistant Commissioner of Data and Research. Owen probably would have had a question or two for Towns, who has never been a fan of being questioned. Hmm… a narrative for everybody, and everybody to their narrative. Long time ASD observer and blogger Gary Rubinstein dives a little deeper into the story, and I encourage you to read what he has to say. Parents of elementary school kids enrolled in MNPS can expect a different look when report cards come home today. I’ll let you decipher the grading formula described by MNPS. I’m still confused. Two new categories are social emotional learning, which I’m not a fan of, and homework, which my son scored a “completes frequently” – a grade I don’t see improving anytime soon. 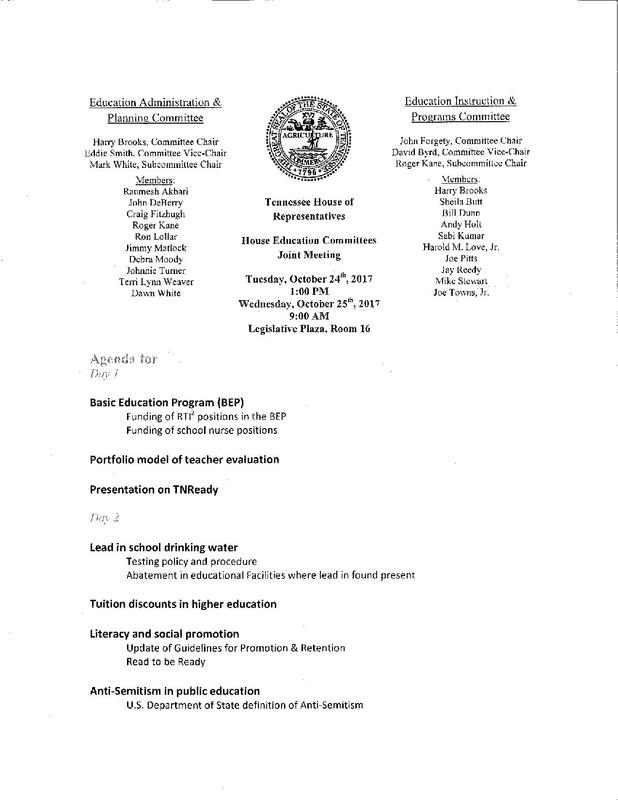 Tuesday and Wednesday of this week, the Tennessee House Education Committee holds joint meetings with some interesting topics. I may have to go on Wednesday to listen in on the one concerned with lead in school drinking water. 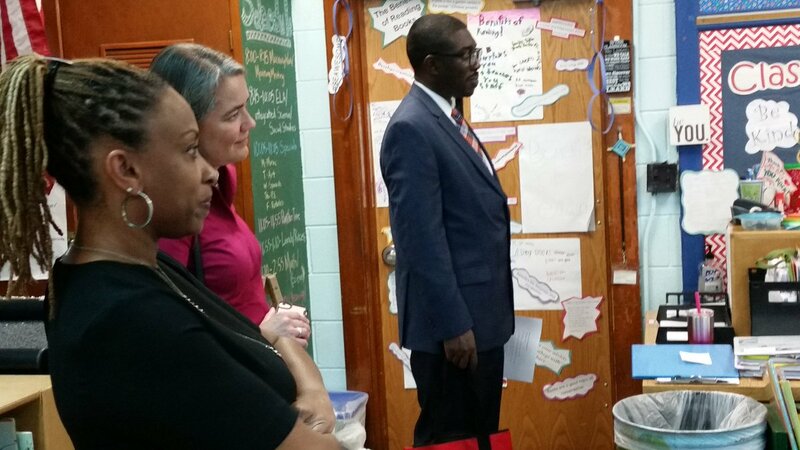 Director of Schools Shawn Joseph and School Board member Amy Frogge spent a part of the morning observing classes at Sylvan Park ES. The unofficial Overton Cluster Pac will meet again on November 6th at Granbery Elementary School. More details coming soon, but save the date. Time now to turn our attention to the results from this weekend’s poll. 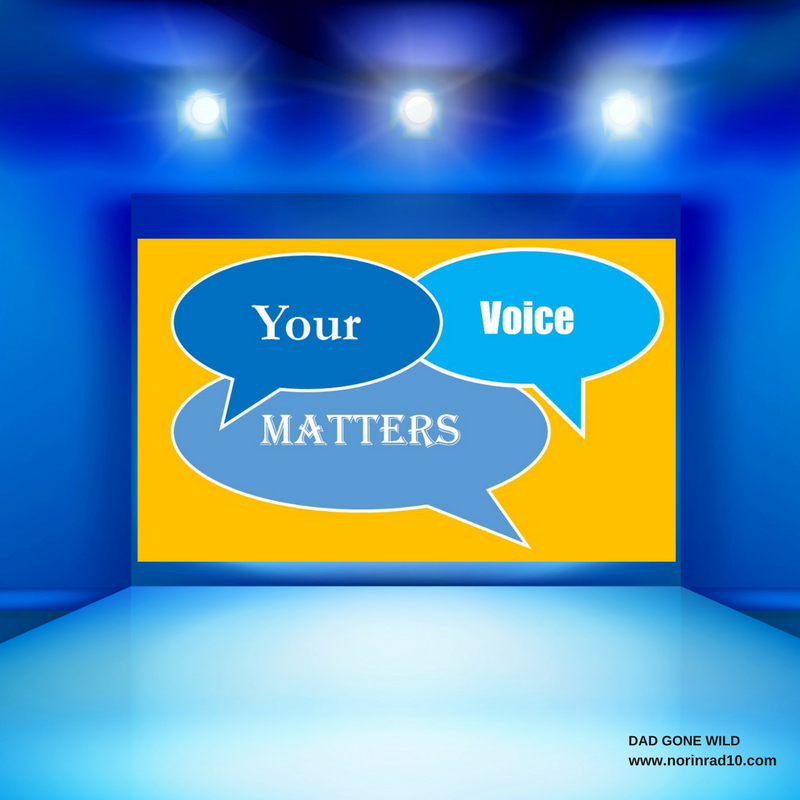 The first question asked for your feedback on the proposed 2017-2018 calendar. In looking at results, it is clear that you wanted to send a message about teacher planning days. Sixty-six percent of you responded that “We need those damn planning days! So give them to us.” While it is unclear as to where the majority of the fault lies for lost planning days, most agree that is a combination of the state and the district. The state didn’t clearly mandate the law and the districts are using it to their advantage. Legislation to alleviate the issue is being explored. One of you asked about what “stockpiled days” means. The way I interpret it is that each district is allowed when submitting their calendar for approval to petition the state for a number of bad weather days plus professional development days not to exceed 13 days. Those are referred to as your “stockpiled” days. If someone has a better explanation, I’m all ears. What is a stockpiled PD Day??? Yes! MANY other issues beyond the 4 questions! Planning days must be restored and a full week the first of school doesn’t work. Question 2 asked, “What is your reaction to 2017 TNReady results?” This was an interesting one, as the two answers, “Not worth the paper they are printed on” and “Indicative of a district on the wrong path” ran neck and neck all weekend before ending up in a dead heat. Therein lies the problem with TNReady. You can’t have a church if nobody believes. Clearly there are a lot of non-believers. One of you asked if it was possible to make an open records request to see tests since they were paid for by tax dollars. Unfortunately not, since the test is considered proprietary. Yeah, I know, just one more thing that doesn’t add up. Last I heard, though, there were plans to release portions of the test to parents. I’ll believe it when I see it. since tax $ paid for tests, can we make an open record request for copies? Our teachers & kids are working hard, but those scores don’t reflect that. Glad my kid is out and I don’t have to deal with it. The last question was in response to the IFL math units. Thirty-six percent of you wondered why the district didn’t trust district teachers to write their own. Thirteen percent called them worthless. Kinda says it all, doesn’t it? The Task Arcs written by IFL are great. Hope the units are as good. Didn’t even know we had these, and I teach elementary. The literacy IFL units are decent, but the one size fits all demand is disheartening. Until Monique Felder is fired, we won’t see improvement. Scripted lessons are just a way to teach to test and harness test to classroom. That’s it for today. Feel free to contact me at norinrad10@yahoo.com and check out the Dad Gone Wild Facebook page. Vera Ruffin says that TN Ready has a “rigorous set of expectations developed by Tennessee educators.” Who are these “educators” exactly? Are they classroom teachers? I would like to know their names and their teaching credentials. Is anyone acknowledging that TnReady is still Common Core, but with a new name?